IDE Group former Senior Product Developer, John Paul McKeown recently supported the Society of Medical Innovation (SOMI) 2017 Hackathon. We spoke to John Paul about his involvement and how these types of events aim to shape Australia’s future medical technology innovators. What was your involvement in the event? The event was spread over two days and went for about three hours each day. On the first day I was involved as a mentor so had the responsibility of visiting each of the teams and answering any questions they had. On the second day I was part of the judging panel. What kind of advice was the most sought after? The students had a lot of varied backgrounds. Some were coming from a medical background and others were from an engineering/biomedical background, so there was a big range in the advice they were seeking. Quite a lot of the students were seeking some kind of electronics support while others were specifically looking for mentors with electronics experience in the medical technology space. In general, there is a trend towards embedded small scale electronics across medical device development. In the past, only relatively advanced machines would incorporate electronics. Now there’s a big push for the use of sensors and alarms in devices that previously would have just been mechanical devices. Overall, most of the students weren’t aware of the finer details of standards such as IEC 60601. Most were seeking advice on how to navigate the approvals process for the design and development of new devices in Australia and abroad. Some of the students were somewhat aware of the approvals process for American markets, e.g. 510K and PMA, but they didn’t have experience of the full implications of how much money, time and effort would be required to get a device to market. What do you hope students took away from the event? A belief that making things happen is possible. Even though we may have knocked back some of their ideas, there is still value in those ideas. Hopefully most of the students left believing that they can push boundaries, because we want them to keep doing that when they join the industry. At the end of the two days, I think most had a better understanding of the right questions to ask when assessing the desirability, viability and feasibility of an idea. But I also hope they developed some skills and confidence to present good rebuttals to the criticism that will inevitably follow when they present new ideas to industry. If you believe in your idea, you’re going to have to stand up for it. Overall, I was very impressed with all of the groups. The standard of presentations was very high, but something I told all of the groups in regards to pitching; don’t forget to tell us what the idea actually is. What was the most valuable thing you took away from the event? The event was really valuable for me because all of the students were so enthusiastic. Sometimes it’s good to challenge your own ingrained assumptions about the way the world works and the limitations of current devices. It makes you question and ask yourself why something is the way it is. From my point of view it was great to see how universities are making efforts to connect people from medical and engineering and engage with industry to prepare their students for the workforce. I hope it continues! 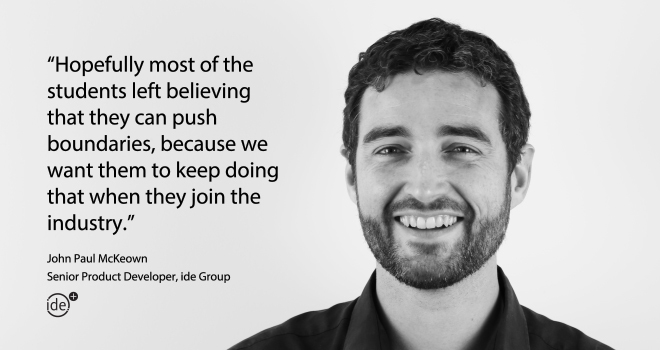 Join the discussion over at ide Connect.